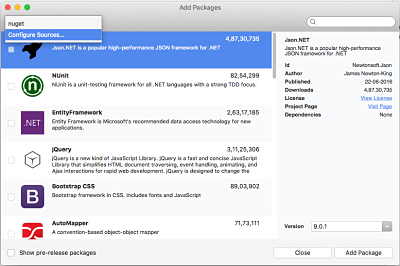 NuGet is a package manager for the .NET framework. 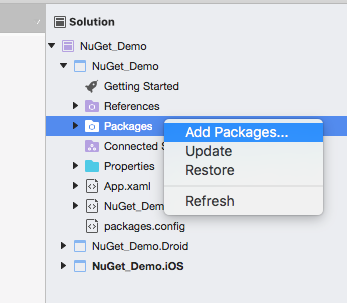 The NuGet client tools simplify the process of installing and upgrading packages. This can be used to automatically add files and references to your Visual Studio projects. 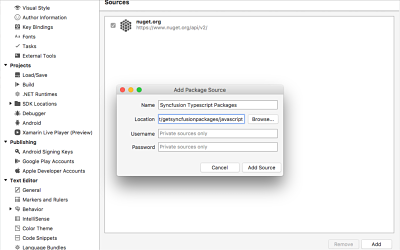 You can use the Syncfusion TypeScript NuGet packages without installing the Essential Studio or TypeScript platform installation to implement the Syncfusion TypeScript controls. Navigate to nuget.syncfusion.com, and select WEB tab. 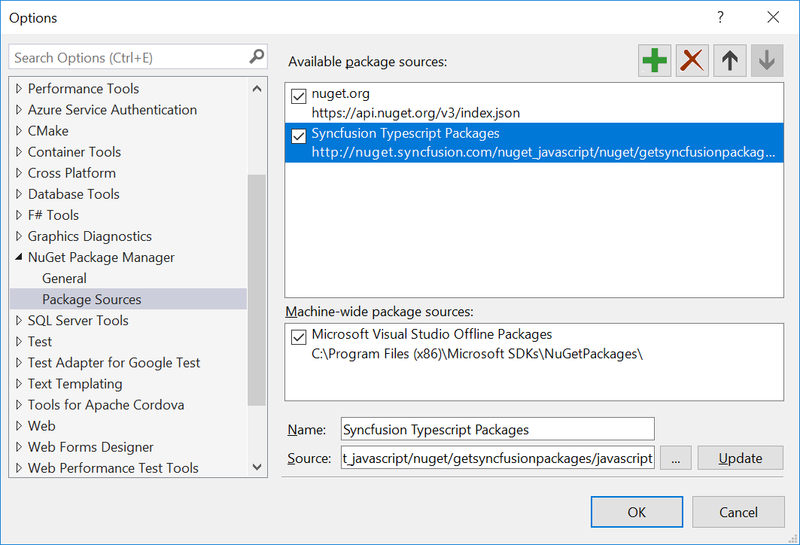 Now, use this NuGet feed URL to access the Syncfusion NuGet Packages in Visual Studio. Open your Visual Studio application. Expand the NuGet Package Manager and select Package Sources. 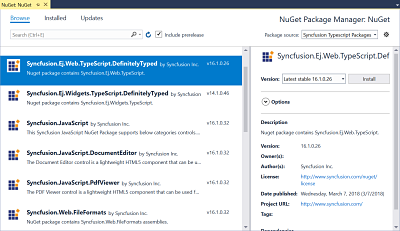 Click the Add button (green plus), and enter the ‘Package Name’ and ‘Package Source URL’ of the Syncfusion TypeScript NuGet packages. Name: Name of the package listed in the available package sources. Click the Update button to add the name and source details to package sources. Choose the Configure Sources… from the dropdown that appears in the left corner of the Add Packages dialog. At the bottom right corner of the dialog, click the Add button to enter the feed name and the URL. Name: Enter the name (For e.g., Syncfusion TypeScript Packages). Now, click Add Source and then click OK.
By default, the NuGet.org package is selected in the Package source drop-down. Select your appropriate feed name that you configured. 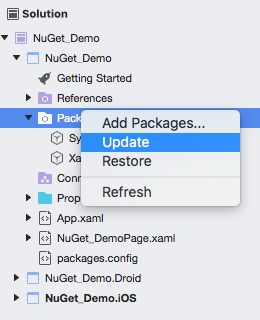 The NuGet Packages are listed and available in the package source feed URL. Search and install the required packages in your application, by clicking Install button. 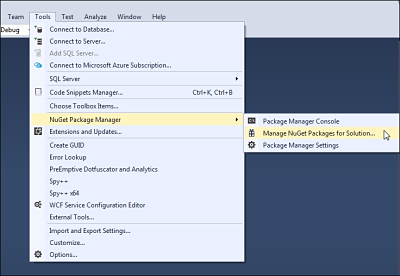 On the Tools menu, select NuGet Package Manager and then Package Manager Console. By default, the NuGet.org package is selected in the Package source drop-down. Select the appropriate feed name. 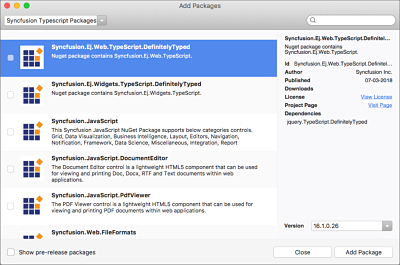 The Syncfusion TypeScript NuGet Packages available in the package source location will be listed. Search and install the required packages in your application, by clicking Add Package button. The NuGet Command Line Interface (CLI), nuget.exe, provides the full extent of NuGet functionality to install, create, publish, and manage packages without making any change to the project files. Download the latest NuGet CLI from here. Download and install the required NuGet packages to a project specified in the package.config. configPath is optional. This identifies the packages.config or solutions file that lists the packages utilized in the project. Select the Updates tab to see the packages available for update from the desired package sources. Select the required packages and the specific version from the dropdown, and click the Update button. Right-click on the Packages folder in the project, and select Update. This will update the NuGet package to the latest version. You can double-click Add packages and choose the specific version. To update all the projects from solution, use update option in the solution level. On the Tools menu, select NuGet Package Manager, and then Package Manager Console. configPath is optional. This identifies the packages.config or solutions file lists the packages utilized in the project. Update command is not working as expected in Mono (Mac and Linux) and projects using PackageReference format.